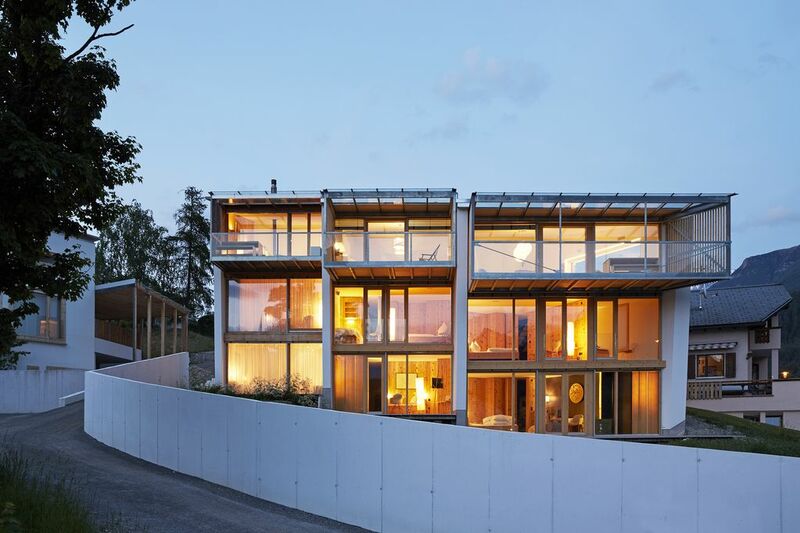 This architecturally stunning house was built in 2007 and has 100 m2 of living space and a spacious balcony with seats in a quiet, sunny location in picturesque Engadin Scuol. Light-flooded living room with Sweden oven/fireplace, long dining table and stylish kitchen will excite you with a stunning view to the west above Scuol. The house is located only 300m from the center of the village and a few steps from the bus stop for the free city & ski buses. It was equipped with a lot of attention to detail and has 5.5 rooms with stunning Swiss stone pine parquet. -wall paneling and wall cupboards. 2 double bedrooms with 1.80m wide double beds + 2 small single bed rooms with 0.90m wide beds. 1 beautiful bathroom with shower and WC and another shower/WC and a designer bathtub located in one of the bedrooms. Modern kitchen with dishwasher, induction stove, oven and stylish, lit, glass cabinets. Please pay attention to the somewhat steep stairs. Swiss National Park: In the Swiss national park, no animals are hunted, no trees are cut down, no meadows are mowed. Here the conditions prevail that prevailed before people moved in here 5000 years ago. With its founding in 1914, the first national park in the Alps and Middle-Europe was created. The Swiss national park has a lot to offer on 172 km2: 80 km of hiking paths - digital hiking tours with GPS-navigation - wildlife observations - nature education - nature trails - families and children excursions - led tours - talks in the national park house and museum in Zernez, here you will find video exhibitions, other exhibitions and a digital information system. Bike highlights: Here are the biking highlights for the vacation region ENGADIN/Scuol: - national park bike marathon: all around the Swiss national park, sarts in Scuol, Fuldera, Livigno, S-chanf. Longest length 138 km and 4,010 m elevation, always during the second half of august. - national park bike tour: bookable packages without luggage on a part of the national park bike marathon trail - Val S-charl, Val d'Uina, Val Sinestra: the unforgettable side valleys of Unterengadin. The rock path in Val d'Uina belongs to the top highlights in Europe. - Downhill paths Motta Naluns - Scuol: the first in Switzerland. Not for scaredy cats. The toilets have suction devices with charcoal absorber to prevent smells; individually controllable heated flooring, automatic ventilation and heat recovery. The house saves a lot of energy and is ecological: due to the especially strong insulation of the facade and windows plus the automatic ventilation and heat recovery, energy consumption is minimized and fresh air is constantly lead into the house. Thus, you will sleep better at night and enjoy your vacation even more. The kitchen has a modern induction stove that heats up a lot quicker and requires less energy, raclette and fondue equipment. The heated flooring can be controlled for each room and provides for a comfortable wellness climate. Bread service and free taxi transfer for those arriving by train: arrival day after 14:00 from the Scuol train station to Afida SA (our organizer on site) and then to your vacation apartment. The historic centre of Scuol is a beautiful place, almost ridiculously pictureseque, and the house is ideally situated for it -- just a couple of minutes walk will take you it and to a little supermarket, bakery and so on, with more facilities (including the spa) up the hill. The modern architecture of the house itself is unusual for this area, and attracted a certain amount of interest from locals while we were staying, so you can expect some attention as you sit on your balcony (don't therefore if you're after privacy; its position means that you are rather on show as you sit out or open your bedroom blinds). When we visited (Aug/Sept 2008) our stay was rather spoilt by noisy building work immediately adjacent to the property, and the overall effect of the house was compromised by its being essentially on a building site (!). We were warned about this and given a price reduction before we booked, but the work was far less advanced than we or the owner had expected, and they were still pouring concrete when we left in the second week in September. Nevertheless, the view remained uninterrupted. The house is well fitted out, although quite how long what looks to be an untreated floor will last when the downstairs shower room door opens straight onto it is at best uncertain. Occasionally one feels that style has triumphed over practicality; in consequence there are rather a large number of house rules in the hope of preserving its pristine condition. One gripe is the owner certainly at present cannot claim garden status for what amounts to a strip of green (or rubble, when we were there) around the house. The rental agency that handle the property are efficient and courteous, the area is wonderful, the walking excellent, and the people friendly. Visit the aptly-named Hotel Paradiso in nearby Ftan (two ** Michelin restaurant in the evening), but unless your pockets are as deep as the Grand Canyon, just go for lunch on the terrace, and be prepared to be dazzled. Scuol must see most of its action in the winter as a ski-resort, but there's lots here to see and do in the summer. Das Haus hat eine gute Raumaufteilung, ist gut durchdacht und durch die grossen Fenster sehr hell und sonnig. Von der sonnigen Terasse hat man einen schönen Blick auf Scuol und die Berge. Die Einrichtung ist gepflegt und geschmacksvoll. Wir haben das Haus sehr sauber vorgefunden. Die Küche ist sehr gut ausgestattet und es stehen Ferienlektüre und Familienspiele zur Verfügung. Die exellente TV und Musikanlage hat viel spass gemacht. Wir waren schon zum zweiten Mal im I Palatio und kommen immer gerne wieder. Das Haus bietet viel Platz, ist gut ausgestattet und hat mit den drei Stockwerken genügend Rückzugsorte. Das Ferienhaus hat ziemlich genau übereingestimmt mit den Angaben im Internet. Das Feriendomizil war sauber, super gut ausgestattet in der Küche sowie mit Non-Food Artikel (bsp. Klopapier, Glühbirnen, Gemeinschaftsspiele…). Durch den Vermieter fühlten wir uns gut betreut und mit den frühzeitigen Informationen per Mail kein Problem das Haus zu finden und sich darauf einzustimmen. Wir werden das Haus sicher Freunden weiterempfehlen. Da wir in den Skiferien waren, haben wir das warme und wohlige daheim sehr genossen und sind nur einmal in eine Pizzeria und ins Bad. Gute Architektur, grosszügige Küche und Wohnraum, exzellente TV und Musikanlage, heimelige Zimmer, fantastischer Blick Richtung Scuol und Berge, mehr als vollständige Ausstattung - wir haben uns hier über Weihnachten / Neujahr sehr wohl gefühlt und freuen uns schon jetzt auf unseren nächsten Aufenthalt! Wir haben uns von Anfang an in diesem tollen Ferienhaus wohl gefühlt. Das Haus ist äusserst raffiniert und mit viel Herz und Verstand gebaut. Die Raumaufteilung ist gut durchdacht und familienfreundlich, die Einrichtung gepflegt und geschmackvoll. Die Betreuung durch den Vermieter war sympathisch und zuverlässig, alle Angaben und Hinweise waren gut verständlich und klar. Wir kommen alle gerne in dieses Haus zurück, um erholsame und stressfreie Ferien zu geniessen. Scuol is the main city in Unterengadin. The fantastic spa Bogn Engiadina Scuol - with mineral water from the famous springs - invites you to relax, just as the hiking and winter sport area of Motta Naluns does (1250 m to 2800 m above sea level). Beautiful lodges with fantastic views invite you to dream. In addition to the ski area with long slopes that lead down into the valley, guests will also find beautiful hiking paths during the summer and winter. Mountain biking and golfing (9 hole course) and para-gliding are only a few of the countless sporting possibilities. Great bars and restaurants (including 2 Relais & Chateau) guarantee diverse evenings at a high level. The main shopping street Stradun has 40 shops and is located between the two, well preserved old villages Scuol Sura and Suol Sot (Upper and Lower Scuol). The wonderful, historical Engadin-Houses invite you to go for walks. Carbonated mineral water flows from different springs in the city. Ski: The snow sport area Motta Naluns (1250 - 2785 m above sea level) is located in the sunny area above Scuol, Ftan and Sent with a panorama view of the Unterengadin Dolmites. The clearly laid out region can be reached from Scuol and Ftan, there are 11 more facilities located above. -80 km of slopes between 1250 and 2800 meters above sea level. - 10 km long slope to Sent, more valley descents to Scuol and Ftan - fun park - expansive free ride area - large area for children with tow ropes, organized activities on the slopes and tunnels, day-long daycare - Good price/performance ratio, big discounts for children - snow pass in combination with Engadin spa Scuol or Rhaetian trains (RhB) - Daily card plus 1 Franc and the RhB will be included from Chur, Landquart, St. Moritz, etc - Transport capacity of the trains and lifts 17000 people per hour - 3.5 km slide Prui - Ftan, Air-board slope - 3 km sunny slopes Motta Naluns, skating and classical sunny winter hiking paths.